Covering 71 percent of the planet, oceans provided the unique environmental conditions necessary for the building blocks of life to form billions of years ago and continue to support life in important ways today--they are home to nearly 50% of all species on earth; they influence climate and weather patterns; they provide food and water for humankind. Yet they are being threatened by human activity and natural disasters. 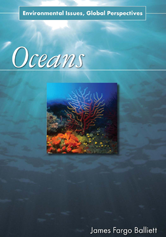 The case studies in Oceans include a discussion of the most remote locations along the Mid-Atlantic Ridge, where new ocean floor is being formed underwater; the Maldive Islands, where rising sea levels may force residents to abandon their communities; and the North Sea, where fishing stocks have been dangerously depleted as a result of multiple nations' unrelenting removal of certain species.